Watch this video for 5 minutes and 30 seconds and you will save a lot of time. If you have only one meeting a week and create very few tasks, there is no need to organize your information by project or department and feel free to skip this section. If, however, you manage a more complicated organization and work on various projects and with different departments, MeetingKing makes it easy to organize your information! 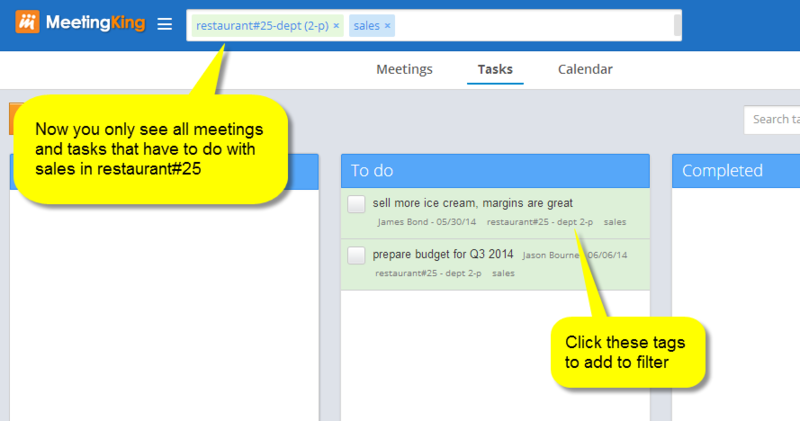 When you are on the Meetings page, Tasks page or Calendar page, simply click a tag under a meeting or task and it will be added to the filter at the top. Now you only see those meetings and tasks that have to do with that project, department or tag. What is more you can even make combinations. For example find all tasks and meetings that have to do with “sales” for “restaurant #25”. Traditional task and project management tools often work with folders. Tagging is similar but the big advantage of tagging is that you can associate any item with multiple tags, projects or departments. For example a certain task may be related to project “Launch Widget” and be relevant for the “Marketing” department. Projects, departments and tags are very similar. The big difference is that projects and departments have members and regular tags do not. Projects are presented in an orange tag with “pjct” and the number of people associated with the project. Departments are presented in an green tag with “dept” added to the name and the number of people in the department. Regular tags are blue.